We have had such a great time learning more about Amy Krouse Rosenthal's books this month as part of our Virtual Book Club for Kids. The Virtual Book Club for Kids is hosted by Toddler Approved (me! ), Mommy and Me Book Club, The Educators' Spin On It, Rainy Day Mum, and 20+ kid bloggers. This month we chose to feature the book Cookies: Bite-Size Life Lessons. If you love cookies, you will want to run and buy this book right now! I am buying a copy for all of my sisters and my mom for Christmas. This book is absolutely adorable! My 4 year old son and toddler daughter loved reading it and my husband and I thought it was quite entertaining too. The life lessons that are shared are so simply illustrated using cookie situations. I actually laughed out loud at a few of them. Each page shares a new lesson along with a cookie analogy... for example, "Cooperate means, How about you add the chips while I stir?" or "Trustworthy means, If you ask me to hold your cookie until you come back, when you come back, I will still be holding your cookie." Words such as patient, respect, proud, modest, etc. are explained in such a straightforward and visual manner. There are so many ways that this book could be used to teach and discuss different life lessons in a classroom or home. We loved it! We practiced sharing materials and supplies during this activity. Materials Needed: various brown objects that are different textures, scissors, light colored paper, and glue. Draw a circle on a piece of light colored paper. Glue different textured objects onto your light colored paper circle. 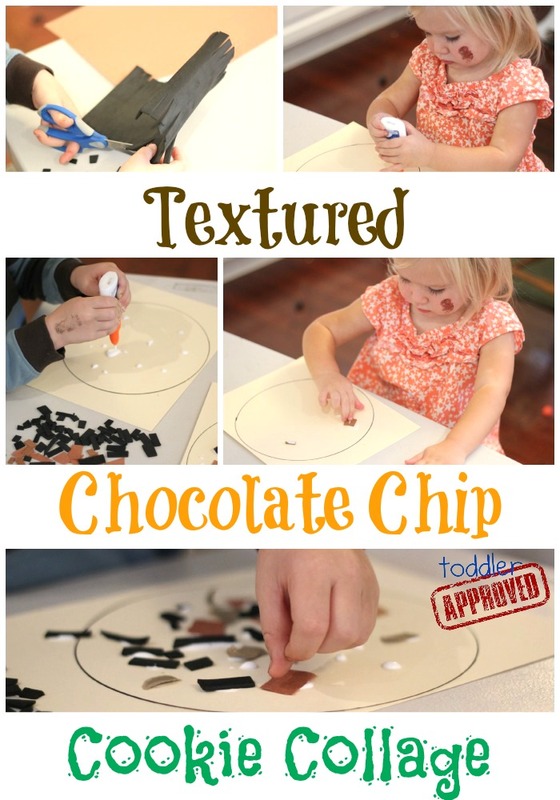 Cut out chocolate chip cookie collage when you are done! This collage is super simple and very open ended, so it works for kids of a variety of ages. We learned words like bumpy, rough, soft, smooth, and sticky and practiced simple scissor skills. We practiced cooperating, taking turns, and being patient during this activity. 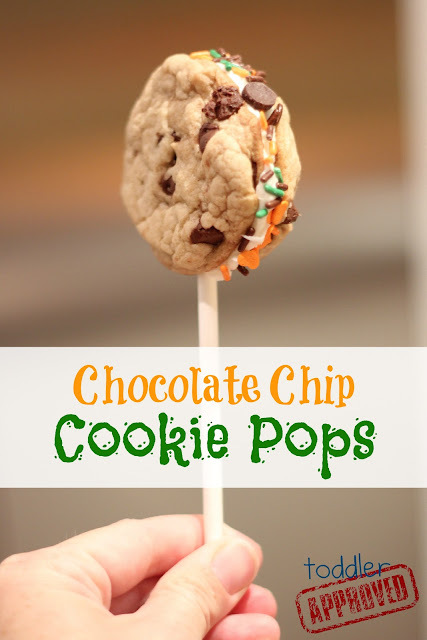 These were inspired by the plethora of chocolate chip cookie pops we saw on pinterest. I don't know how I never thought to try these before... since I love cookies with frosting in between them. Yum! Materials Needed: ingredients to make your favorite chocolate chip cookies, frosting, festive sprinkles, and lollipop sticks. Make the dough for your favorite chocolate chip cookies. 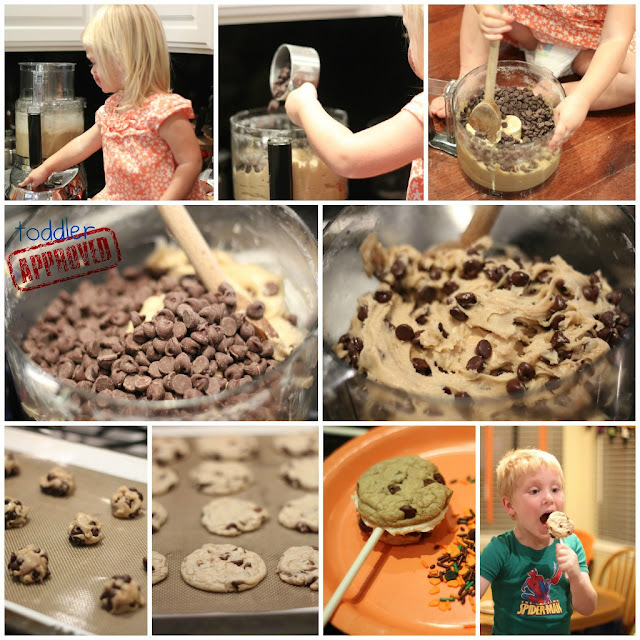 We used my mom's secret recipe, but we also love this Nestle Tollhouse one. Shape your dough into tiny balls. We used a grapefruit spoon to help make ours. Flatten the balls a bit and try and make them all the same size. Bake. Ours baked at 350 for 10 minutes. Let them cool and set up. Lather frosting on the flat side of both cookies. Stick a lollipop stick on the frosting on one cookie. Put the other cookie on top to make a cookie sandwich (with a lollipop stick in between). Roll the frosting edges in festive sprinkles and then eat! These would also be awesome to make with ice cream instead of frosting and would probably hold up better. We are planning to try that with our leftover cookies tomorrow. Come share it on our Facebook page or in the comments! I am always looking for new ones to try. Have you done any other chocolate chip cookie themed crafts or activities? Now that we've shared our crafts and activities with you, we're excited to see what you came up with! Please add your links to any Amy Krouse Rosenthal inspired posts to the blog hop linky below. Link up only posts inspired by Amy Krouse Rosenthal that share children's book inspired crafts, activities, recipes, etc. Any other posts will be deleted. Amy Krouse Rosenthal has so many more books that I want to check out. I love that she uses a cookie to teach life lessons. I definitely want to read this book now! Fun activities! 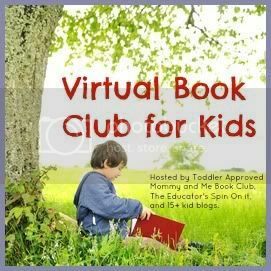 What a fun book club for kids! Thanks for setting up and sharing. I was so tempted to make cookies, too, for One Smart Cookie, but we recently made a lot of sweets...we may have to do this next week! They look so yummy. ARGH! Those cookie pops look amazing!!! I want one now. :) The collage is awesome too- great idea! Thanks for sharing at The Sunday Showcase this week! What a wonderful expression in that last picture! I think I'd be equally delighted to have such a delicious treat. I love your cookie ideas! That wasn't one of Rosenthal's books that we read this month, but if it's an excuse to make and eat chocolate chip cookies, I'm going to get it now!